Taking an improv class will change your life. I’m not saying that becuase it’s the best marketing slogan I could come up with. I’m saying that because it’s the truth. Even if you’re not interested at all in acting or being up on stage. Even if you have social anxiety and the thought of even talking to strangers (much less, signing up for a class with them) is terrifying–actually improv will change your life ESPECIALLY if this is true. Improvisational games and exercises are a bit like “playtime” for adults. So, of course, it’s fun and helps open up your creativity. But it also makes you a better listener and a more present human. 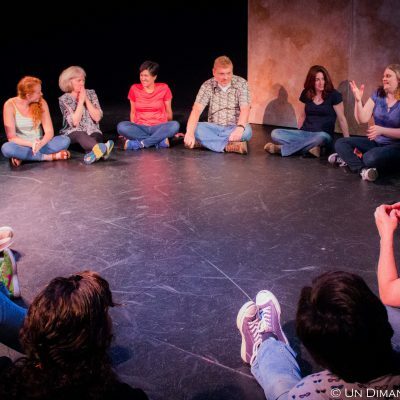 I’ve taught improv for beginners for over twenty years and it is one of my favorite classes to teach, particularly because so many of my students convey to me how positively life-changing it was for them. I’m delighted to be offering my beginner improv class for adults at Forsyth Academy of Performing Arts (where I’ve been teaching youth/teen classes since 2014) this fall. It’s an 8-week class that meets every Saturday at 10am starting September 9th. If you ever thought it might be fun to learn improv or if you’ve been thinking that it might be nice to do a little something different, consider this your sign to go for it! I’d love to see you in class. Click here to register today!